Like any other surgery, there are numerous risks and potential complications of liposuction. A patient must know about these complications to be able to decide if the benefits will make them achieve their goals and if the risks of liposuction are acceptable. Contour irregularities: Your skin might appear bumpy, wavy or withered due to uneven fat removal. These changes might be permanent. Besides, the liposuction canula might damage the tissue under the skin and give the skin a permanent spotted appearance. Seromas: A seroma is a collection of fluid from the blood that has pooled at the liposuction site. This fluid might need to be drained with a needle. Burns: During suction, the ultrasound probe that is used to liquefy fat or tighten skin may become very hot and can cause burns. Toxicity from Anesthesia: Lidocaine, an anesthetic that used to numb tissue in a specific area, is frequently used as a local anesthetic during liposuction. Overdoses with lidocaine may cause the heart to stop. 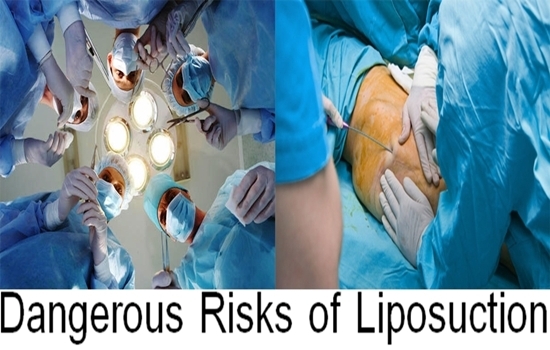 Risk of Death: Some of the studies indicate that the risk of death due to liposuction is as low as 3 deaths for every 100,000 liposuction operations performed. However, other studies indicate that the risk of death is between 20 and 100 deaths per 100,000 liposuction procedures. Several studies estimated how often patients undergoing liposuction die during the procedure or as a result of it, but all are just estimates. Those risks could be associated with any other surgery, but liposuction should be done only by surgeons who are specifically trained to do liposuction and in how to deal with any emergency problem that may occur during the surgery.